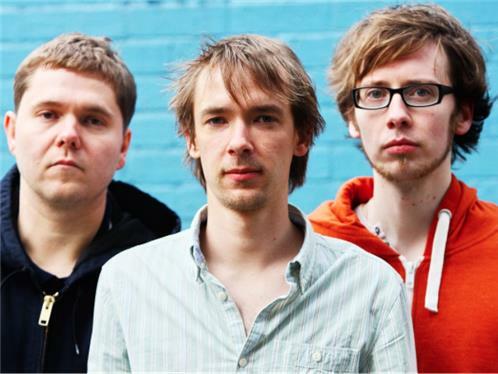 "Its been an astonishing couple of years for Manchester based trio GoGo Penguin (drummer Rob Turner, double bassist Nick Blacka and pianist Chris Illingworth). Their trademark mash-up of minimalist piano themes, deeply propulsive bass lines and electronica-inspired drums has seen them shortlisted for the Mercury Prize and fuelled their exhilarating live shows from Manchester to Montreal and Paris to London. Theyve written and performed a new score for Godfrey Reggios cult film Koyaanisqatsi and collaborated with noted choreographer Lynn Page for a Gilles Peterson-curated night at the Barbican. And in the midst of all this theyve signed a multi-album deal with Blue Note Records, the most famous jazz label on earth. Their new album is called Man Made Object and its the sound of a band confidently pursuing their own path. The title is partly inspired by my fascination with ideas of robotics, transhumanism and human augmentation, says pianist Illingworth. Were recreating electronic music on acoustic instruments. Its like a man-made object that has become humanised and it seemed like a good album title, one that also means something different to each of us, and hopefully to each listener. Indeed, although they're predominately an acoustic piano trio, GoGo Penguins music draws from many areas of contemporary electronic music, one where you can hear arcade game bleeps, glitchy breakbeats, hypnotic Aphex-style melodies, grinding bass lines and a rumbling low-end. It has been described as acoustic electronica, a term which perfectly sums up their modus operandi. Many of the songs on this album started out as electronic compositions that I made on sequencing software like Logic or Ableton, says drummer Turner. Ill then play it to the band and well find ways of replicating it acoustically. And it is that ability to synthesis the seemingly disparate influences of electronica, jazz and classical music into their own unique musical DNA that gives GoGo Penguin such an instantly recognisable and compelling sound. One that is set to reach an even wider audience with the release of Man Made Object on February 5 2016."